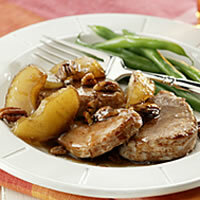 With comforting aromas of warm apples and pecans, this quick dinner from Ann Council is perfect for a fall week night. Trim fat from pork. Cut pork into 1/2-inch-thick slices. Melt butter in a large skillet over medium-high heat until it sizzles. Reduce heat to medium. Arrange pork slices in skillet. Cook for 2 minutes; turn slices. Spoon apples over pork. Sprinkle with brown sugar and pecans. Cover and cook for 4 to 6 minutes more until internal temperature on a thermometer reads 160° F.